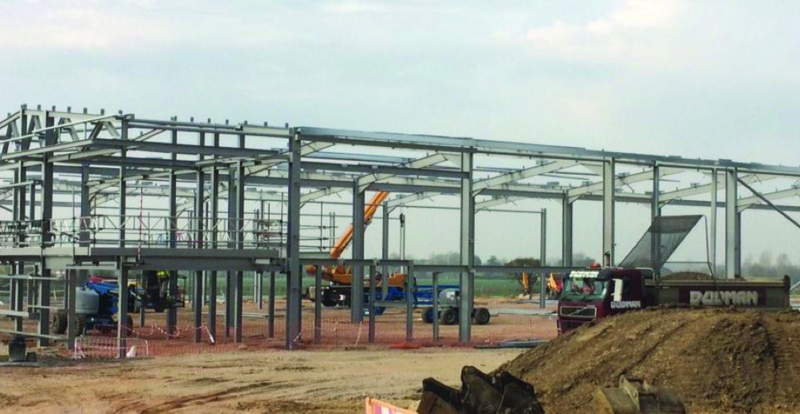 Progress this month has been good with excellent weather allowing the construction of the steel frame of the warehouse and office building to proceed rapidly. The soil stabilisation of the site was completed in March and the warehouse footprint levelled and covered with a layer of limestone to protect it and provide the base foundation for the concrete pad. The site was laser levelled and using GPS and lasers a foundation grid was established and concrete foundations with holding bolts built. In the eight days since the team of steel erectors arrived on site they have completed almost half of the 9m tall steel frame. The first roofing elements are due in early May and their installation will be followed by a team installing almost 700 solar panels on the roof. The concrete slab will be laid after the roof and side cladding are installed, in June.